The weather has been a bit off recently. We had a glimpse of summer and just when we'd got ourselves ready for it, it went. My jeans have been really handy for the stop-start sun... 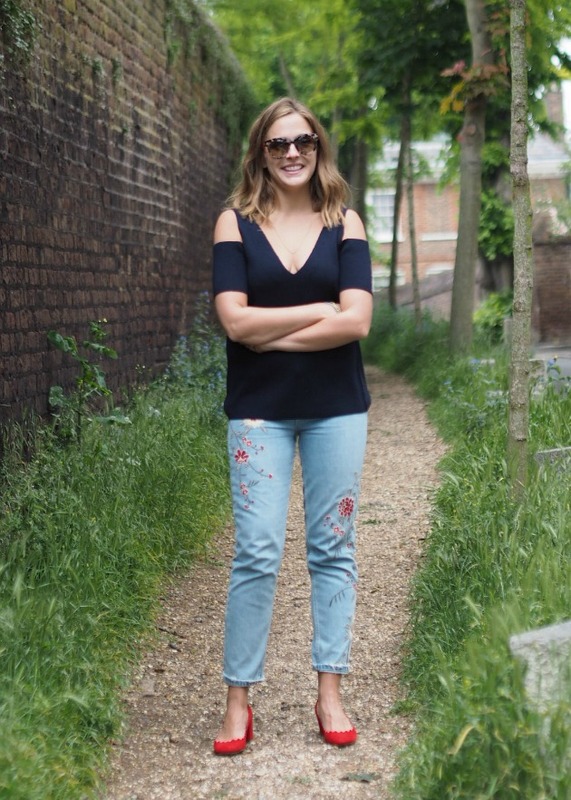 They're my favourite fit from Topshop; the mom jean that you already know I live in. 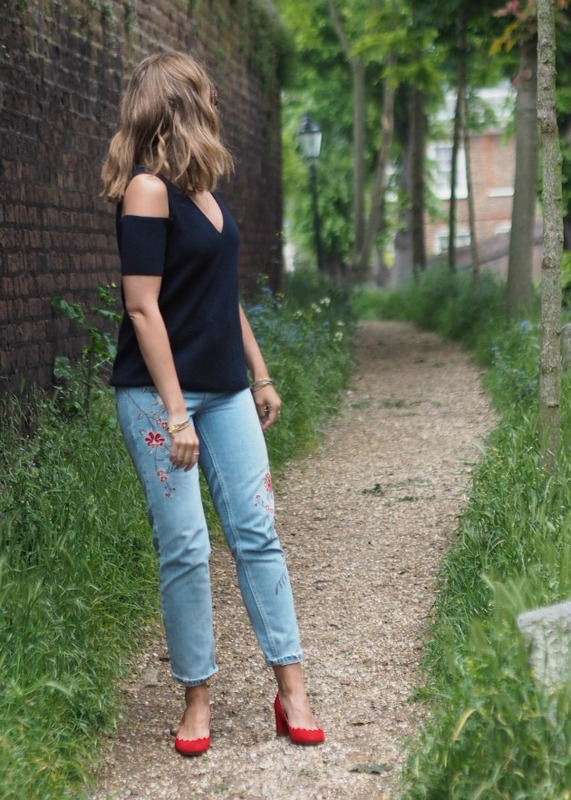 When the brand asked me to pick out some of my favourite summer transition pieces they really stood out as they're a bit more interesting that plain jeans, yet aren't overly "in your face" patterned... Get them here. I bought some lovely little white vests to go with them, which it was a bit too chilly to shoot but will be making an appearance soon. (NB - buy your regular size and take the pain of the first couple of hours of them being too tight, they stretch...). The shoes... ahhh the shoes. My beautiful Chloe pumps here. I'm so pleased with these, and so glad I got them in red as my inner-neutral self really wanted the taupe coloured ones. They're perfect for a little bit of a statement... I've found some high street similars here and here in black and white for £20 so I bought those as well so I have the best of both worlds! As a note, they come up small. I am always a size 4, as these are, and after one wear the suede stretches a little so I needed an insole... So if you are treating yourself, go a size down. Last but not least, my hair. I went to Sassoon Salons last month and has the best time sorting out my locks. I've been going to the salon for three years now and if you look back on photos of me pre-Sassoon it really was a sorry tale. My hair is now so much thicker, the colour is so much better for my skin tone, and the cut is just... Good. Also, I love the coffee there, and the team are so lovely that it feels like home as soon as I walk in... I need to leave you now as am off to a barbecue with my girlfriends, in the typically gloomy London weather. Happy Sunday!